Princeton University Press, 9780691160467, 400pp. Renowned evolutionary biologists Peter and Rosemary Grant have produced landmark studies of the Galapagos finches first made famous by Charles Darwin. In How and Why Species Multiply, they offered a complete evolutionary history of Darwin's finches since their origin almost three million years ago. Now, in their richly illustrated new book, 40 Years of Evolution, the authors turn their attention to events taking place on a contemporary scale. By continuously tracking finch populations over a period of four decades, they uncover the causes and consequences of significant events leading to evolutionary changes in species. 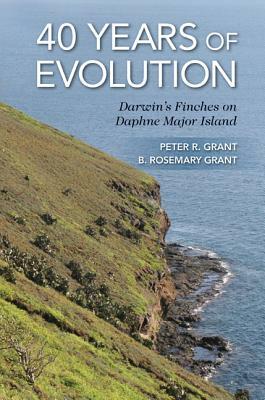 The authors used a vast and unparalleled range of ecological, behavioral, and genetic data--including song recordings, DNA analyses, and feeding and breeding behavior--to measure changes in finch populations on the small island of Daphne Major in the Galapagos archipelago. They find that natural selection happens repeatedly, that finches hybridize and exchange genes rarely, and that they compete for scarce food in times of drought, with the remarkable result that the finch populations today differ significantly in average beak size and shape from those of forty years ago. The authors' most spectacular discovery is the initiation and establishment of a new lineage that now behaves as a new species, differing from others in size, song, and other characteristics. The authors emphasize the immeasurable value of continuous long-term studies of natural populations and of critical opportunities for detecting and understanding rare but significant events. Peter R. Grant and B. Rosemary Grant are both emeritus professors in the Department of Ecology and Evolutionary Biology at Princeton University. They are the coauthors of How and Why Species Multiply and coeditors of In Search of the Causes of Evolution (both Princeton).